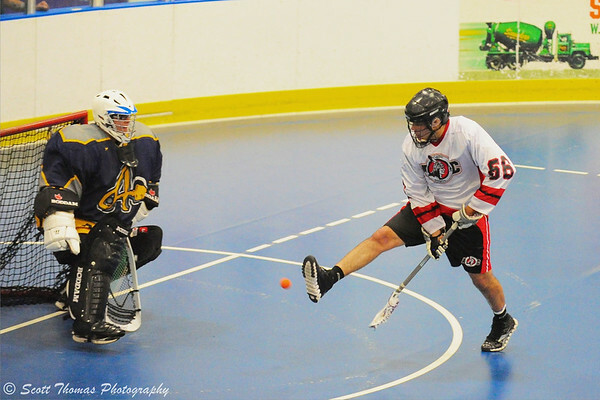 Onondaga Red Hawks Brett Bucktooth (66) goes between the legs to score a goal against the Allegany Arrows in Can-Am Senior "B" Box Lacrosse league action at the Onondaga Nation Arena in Nedrow, New York. Nikon D700/70-200VR, 1/500s, f/2.8, ISO 8000, EV +1.0, 125mm focal length. I found another sport which is fast, played in hockey rink sized arenas and is even tougher to photograph because of the lack of the white ice to reflect light on to the players. 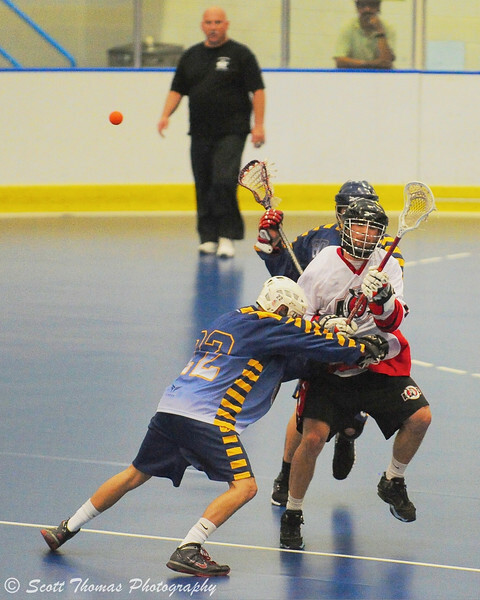 The game is called Box Lacrosse and is very popular in Canada and the United States. I photographed a game between the Allegany Arrows and the Onondaga Red Hawks over the weekend on the Onondaga Nation Territory south of Syracuse, New York in the Tsha’hon’nonyen’dakhwa (Onondaga Nation) arena. Both teams are members of the Can-Am Senior “B” Lacrosse League. Even using the Nikon 70-200mm f/2.8 VR lens, the ISO climbed to 8000 for most of shots. The photos you see here have not had noise reduction done to them. 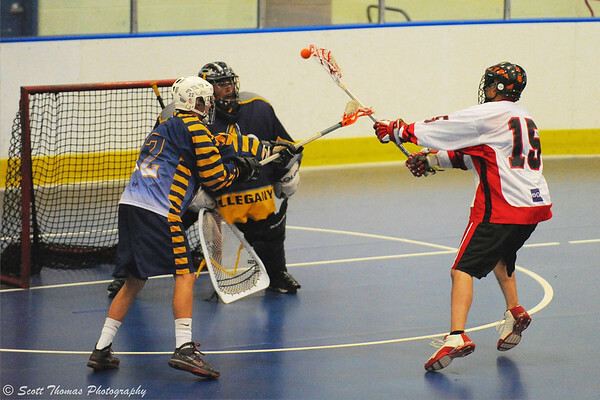 Allegany Arrows try to stop an Onondaga Red Hawk from clearing the ball in hard hitting action of box lacrosse. Nikon D700/70-200VR, 1/800s, f/2.8, ISO 8000, EV +1.0, 200mm focal length. Box lacrosse has hard hitting action, fast play and requires skilled athletic ability to fire a solid rubber 2.5 inch in diameter orange lacrosse ball past a heavily padded goalie who covers almost the entire 4 foot square goal. 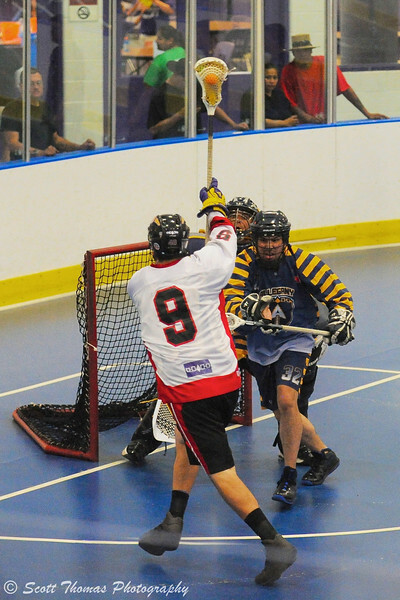 Onondaga Red Hawks Grant Bucktooth (15) sidesteps an Allegany Arrows defender before scoring a goal in Can-Am Senior "B" Box Lacrosse league action. Nikon D700/70-200VR, 1/800s, f/2.8, ISO 8000, EV +1.0, 200mm focal length. Like hockey, each team has a goalie and 5 “runners” on the playing surface at a time. Since the game is played in hockey rinks, players use the boards to check each other against. Unlike hockey, there is a shot clock. The team with the ball must take a shot on goal every 30 seconds or loose possession. This is usually not an issue and creates a fast paced and entertaining game. Onondaga Red Hawks Ron Cogan (9) uses his height to slam dunk a goal over the Allegany Arrows' defenders. Nikon D700/70-200VR, 1/800s, f/2.8, ISO 8000, EV +1.0, 200mm focal length. The Allegany Arrows proved not to be much competition for the home team as the Onondaga Red Hawks scored in double digits while only allowing 4 goals. This entry was posted in Sports, Weekly View and tagged 70-200mm, box lacrosse, goalie, native americans, new york, nikon D700, onondaga nation arena, players, runners, vr. Bookmark the permalink. It is a great sport to watch, Truels, and your son would love it, too. ISO 8000! Wowee! And I really don’t see much “noise” here. Cool. These are small versions which helps to hide the noise. There is some there which can be easily cleaned up.